Are you a fan of Anne Shirley? If so, then I have the perfect DVD gift bundle for your this Christmas. The folks at PBS now have “Anne Of Green Gables, Installments 1-3” available on DVD and Digital for fans of the series to watch time and again. 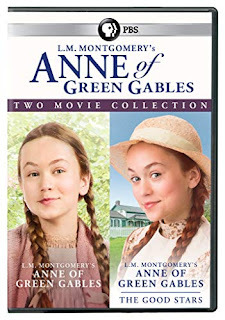 I was recently sent the three DVDs, and have been busy watching the movies with my girls, and introducing them to Anne Shirley -- a favorite PBS series and book series of mine growing up. Growing up, I used to love watching Anne of Green Gables on PBS with my mom. While my brothers were out with my dad, we would have girls night in and do a spa night, and then pop some popcorn or bake cookies, and then settle in on the couch to watch an episode of this popular series, which has been remade over the years into different movies and television series -- all of which are good. I remember my grandmother gave me a box set of the books as a birthday gift one year, and I spent the summer reading all the books, and then watching the episodes I had recorded on VHS to watch and compare the book to the television series. And, now that I have a family of my own, I love being able to watch Anne of Green Gables with my girls, and seeing them get into it. Because my youngest wants to be a teacher, she really enjoy this series, and likes that Anne Shirley is pursuing a teaching path. Even though I don't live at home anymore, I still love watching these special television installments and movies with my mom. Either we will be talking on the phone while watching it, or will talk shortly thereafter about our favorite parts and how this one compared to other Anne of Green Gables movies we have seen over the years. And, come the holidays when my parents come to stay for a few days, I will pull out my Anne of Green Gables DVD collection, and we will pop some popcorn and watch them together just like old times. I really enjoyed the ANNE OF GREEN GABLES – FIRE AND DEW, which is the third installment in the series, and hope you were able to catch it when it aired on television this past Sept. If you missed, now is the perfect time to buy the DVD or digital version or when you get your DVDs or digital version to see what you missed out on. I have to say that this installment is my favorite, and one that I can't wait to watch again. "In ANNE OF GREEN GABLES – FIRE AND DEW, Anne Shirley moves to Charlottetown and is overwhelmed by her new surroundings, difficult classes at teacher’s college and a deepening romance with Gilbert. At the same time, Matthew and Marilla deal with health and financial difficulties that jeopardize their lives at Green Gables. After Anne graduates, she must make an important decision, whether to move back home or continue on to University. Anne then must handle the loss of someone deeply special in her life and just when all seems lost, she discovers the dark cloud over her life has a silver lining. L.M. 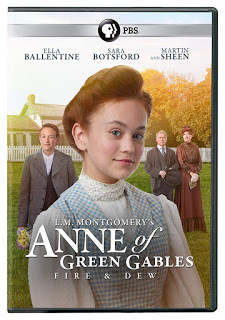 Montgomery’s ANNE OF GREEN GABLES – FIRE AND DEW was produced by Breakthrough Entertainment in association with Corus Entertainment’s YTV and the author’s granddaughter, Kate Macdonald Butler, who served as executive producer." "The second installment of the classic best-selling Lucy Maud Montgomery story of a free-spirited teenager on Prince Edward Island returns after the successful Thanksgiving 2016 premiere, which reached more than 3.2 million viewers. “L.M. MONTGOMERY’S ANNE OF GREEN GABLES THE GOOD STARS” is now available on DVD as of November 7th, 2017. The run time is approximately 90 minutes, and has an SRP of $19.99. The program will also be available for digital download. The program, written and directed by John Kent Harrison will once again star critically acclaimed actor Martin Sheen as Matthew Cuthbert, along with the return of Ella Ballentine as Anne Shirley (“The Captive”) and Sara Botsford (“E.N.G.”) as Marilla Cuthbert. Additional cast members include Julia Lalonde (“Catch a Christmas Star”) as Diana Barry, Kate Hennig (“Thirty Two Short Films About Glenn Gould”) as Rachel Lynde, Stefani Kimber (“Remember”) as Josie Pye, Drew Haytaoglu (“Looks Just Like the Sun”) as Gilbert Blythe, Kyle Gatehouse (“Source Code”) as Mr. Phillips and Linda Kash (“Cinderella Man”) as Mrs. Barry. “L.M. MONTGOMERY’S ANNE OF GREEN GABLES THE GOOD STARS” was produced by Breakthrough Entertainment in association with Corus Entertainment’s YTV and the author’s granddaughter, Kate Macdonald Butler, who served as executive producer."